Incarnate is the third and final book in the Spellmasons Chronicles. We enjoyed this book more than the previous one, however, we still had a couple issues with the novel. Although the world held much promise and the mythology of the stonemasons is fascinating, we felt some of the potential was lost. Though there is more revealed about the other magical/paranormal factions in this novel, they were not deeply crafted. The witches, wizards, and alchemists were only peripherally involved in the story. We were unable to find out much about them and the politics that seem rife in their world. Most of the novel was focused on Stanis and the haven he is creating for the grotesques. It was interesting to see a glimpse of what these reanimated souls were experiencing. When we started this trilogy, we really loved Alexandra’s friends Rory and Marshall. Their support and banter added richness and foundation to the novel. In the previous novel, Stonecast, they were sadly left out for most of the novel. Not only are they fully back in the limelight in Incarnate, but they are joined by two wonderful additions to the supporting cast, Detectives Maron and Rowland. For us, these supporting characters carried the story; we loved their insights and witty repartee. From the beginning we cared for these supporting characters more than Alexandra, who seems immature and self-absorbed. It makes it difficult to enjoy a novel when you do not care for the main character. Our biggest complaint regarding Incarnate and the series in general is the shifting first person points of view. The chapters in the novel alternate between Alexandra’s point of view and Stanis’s. Since it is first person, we are in their heads and in their shoes, experiencing the world through them. Stanis and Alexandra are two very different people. The shifting of perspectives repeatedly pulled us from the flow of the story. It happened occasionally that two chapters in a row would be from the same viewpoint, which would allow us to settle into that perspective, only to be shifted again in the next chapter. We found it frustrating. Though everything works out in the end, it felt just a little too convenient. Without giving anything away, it was as if everyone gets their wish granted. The big red bow at the end of this story just didn’t feel genuine considering the world and the mythology. Don’t get us wrong, we enjoy (and for the most part) want a happy ending – but one that feels honest and befitting the journey, the world, and the personalities involved. The overall story arc started in the first book is resolved at the end; it was left in such a way that a return to this world is possible. We hope giving us stories from some of the supporting cast which was so memorable. 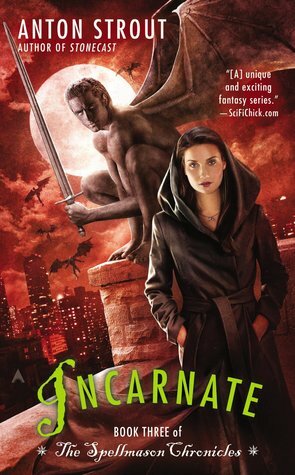 Overall we did prefer Incarnate to the previous book but we still felt let down by the series. There was so much potential with this new and different mythology, but it just didn’t deliver for us. The supporting characters were delightfully witty and kept us turning the pages, though it took time for us to warm up to Alexandra. Though the series was wrapped up and is over, it would be interesting to see if Mr. Strout would return and tell other stories in this world. The possibility was left open at the end.